In the past years, AMD CPU performance hasn’t been revolute. 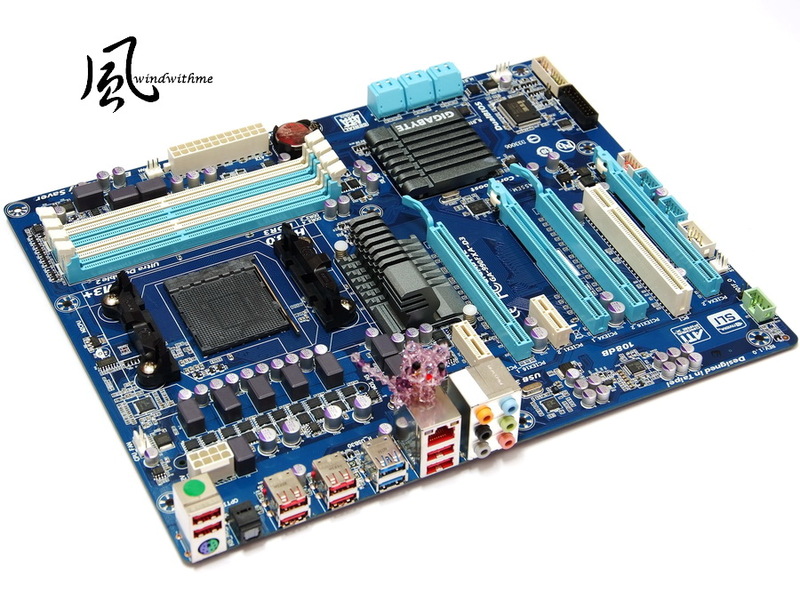 Since 2006, first time K8 performance crossed over by Core 2 Duo, they started to focus on multi-core and parity price. For entry or mainstream PC users, it’s good news. During that time, AMD high end product lost the performance strength, they only could move to mid-end market. After Core i launched, the single core performance gap was even bigger. Multi-core became main product strategy for AMD. 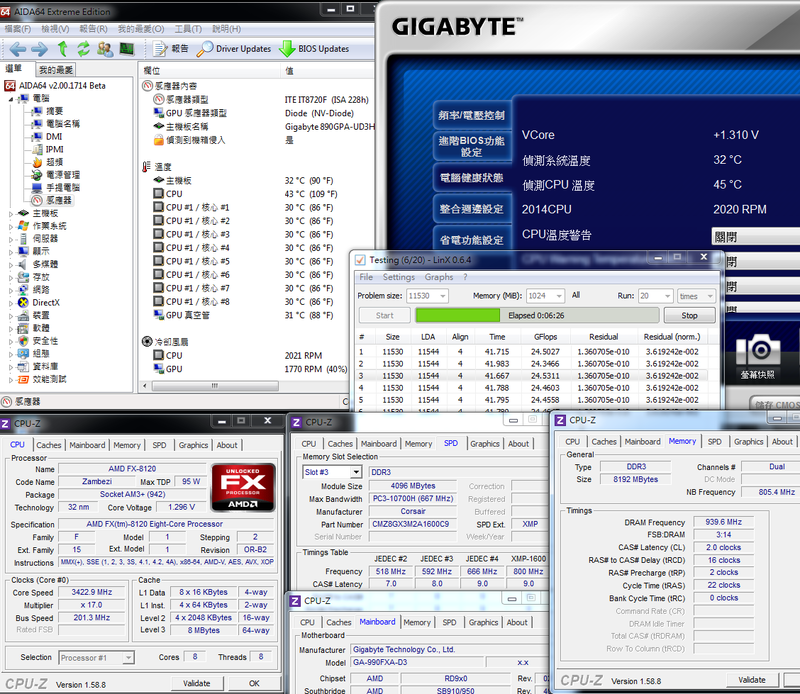 Windwithme would like to share CPU comparison since FX-8120/8150 lanuched. 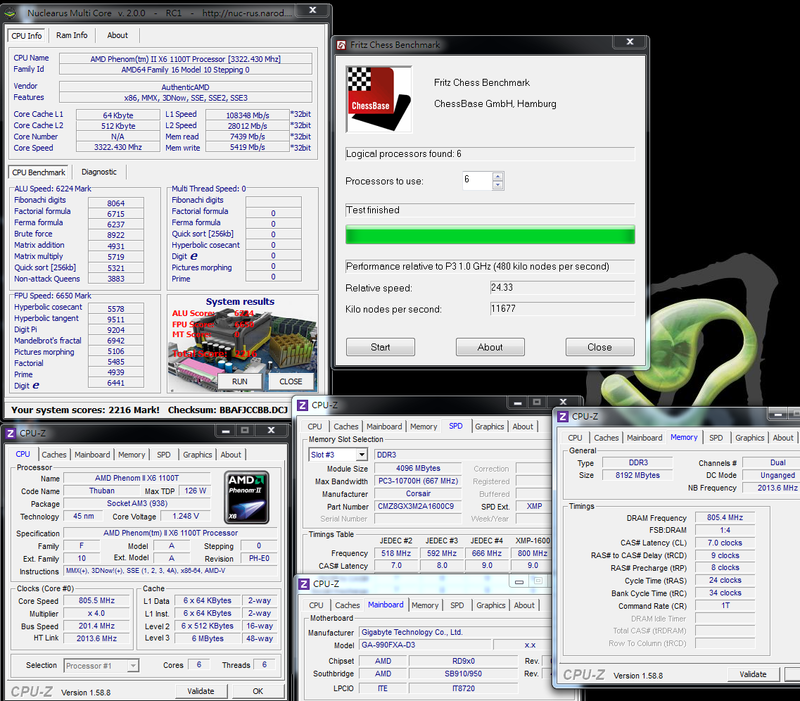 Originally, I would like to use 3 unlocked CPUs which price is around 200USD to compare. 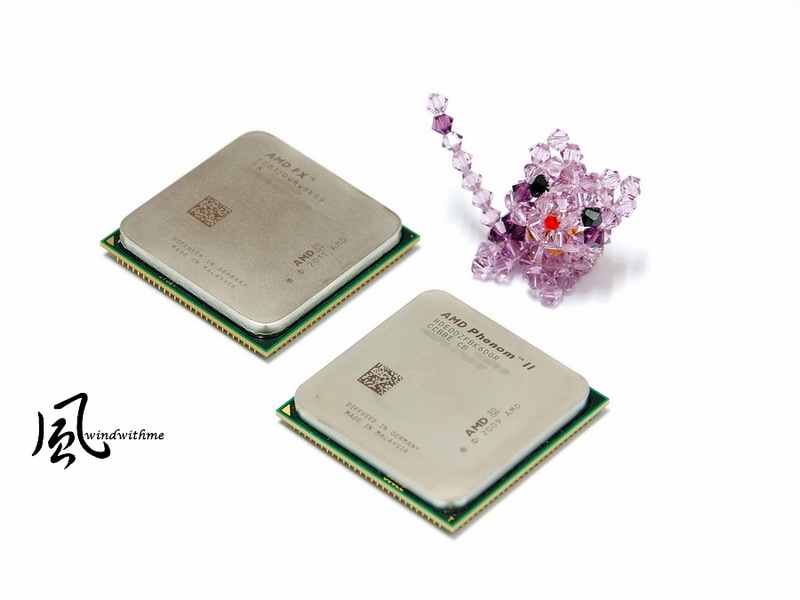 They are AMD Phenom II X6 1100T, AMD FX-8120 and Intel Core i5-2500K. For 2500K performance, I have shared many times which you can refer my former reviews. Moreover, 2500K may make this stage brutally. After consideration, I decided to use AMD only. 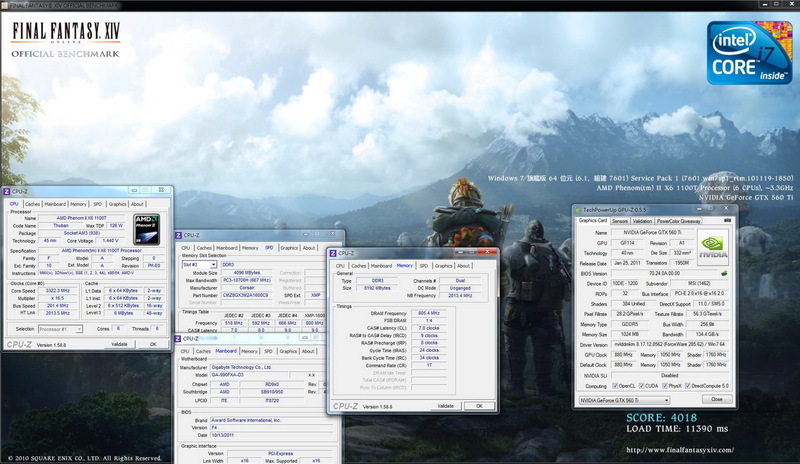 AMD Phenom II X6 series, 1090T has the best C/P value. However, I pick Phenom II X6 1100T due to the price is similar to FX-8120. 1100T packing is all black which meets Black Edition. Left side is AMD Phenom II X6 1100T. Right side is original cooler. Black Edition CPU cooler is bigger size and cooper pipe design. This cooler is same grade as FX-8120. Before the battle, let’s introduce the players. Core name is Thuban and supports Turbo Core to 3.7GHz. L2 is 3MB and L3 is 6MB. Right side representative - AMD FX-8120. Normal FX-8120 is 125W. This review is using lower power consumption version, TDP is 95W. 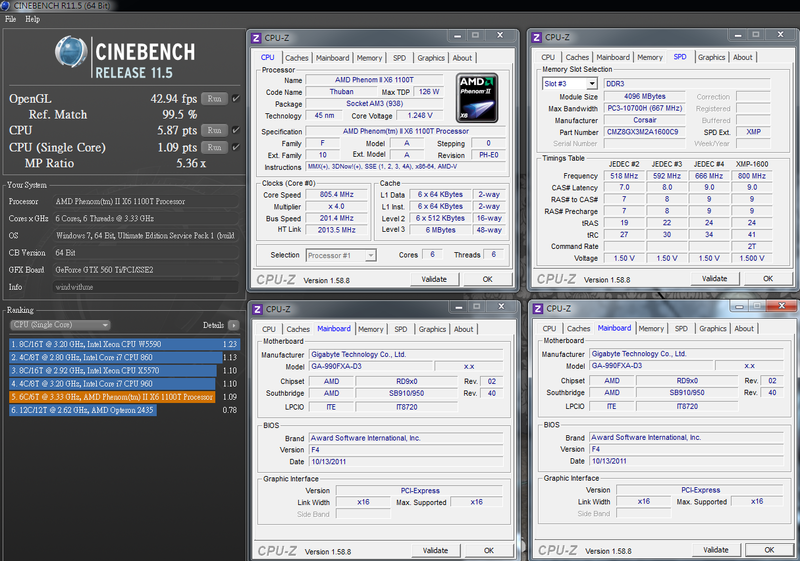 Core name is Zambezi and supports Turbo Core to 4.0GHz. L2 is 8MB and L3 is 8MB. Just judge by spec, FX-8120 manufacturing is more advanced. FX-8120 has bigger L2 and L3 cache. After sharing to each core, actual L3 is 1MB and L2 is 2 times of 1100T. I pick AMD current most high end chipset 990FX - GIGABYTE 990FXA-D3. Using entry 990FX MB can have better C/P. 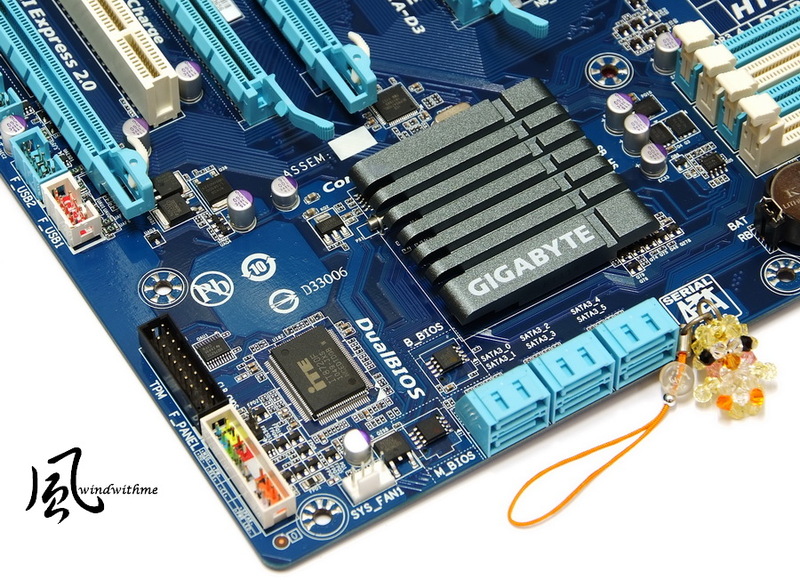 Blue PCB is standard color of GIGABYTE. This year, they also use black PCB for high end MB to enhance texture. 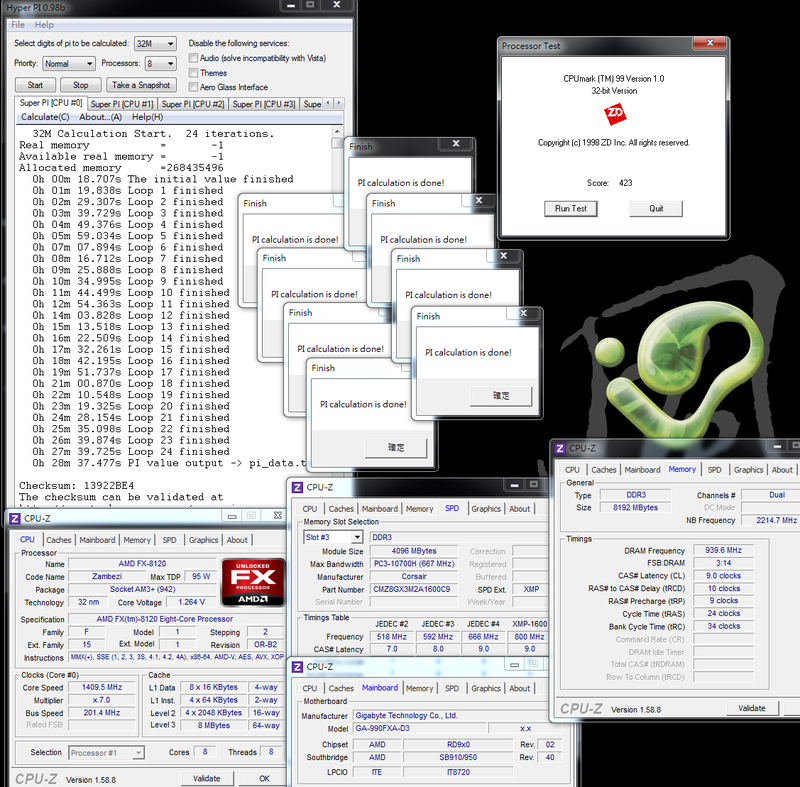 4 X PCI-E 2.0 X16 support 2-Way ATI CrossFireX/nVIDIA SLI. Dual VGA bandwidth is X16+X16. The others are X4. Realtek ALC889 audio chip supports 7.1 channels High Definition Audio and S/PDIF output. 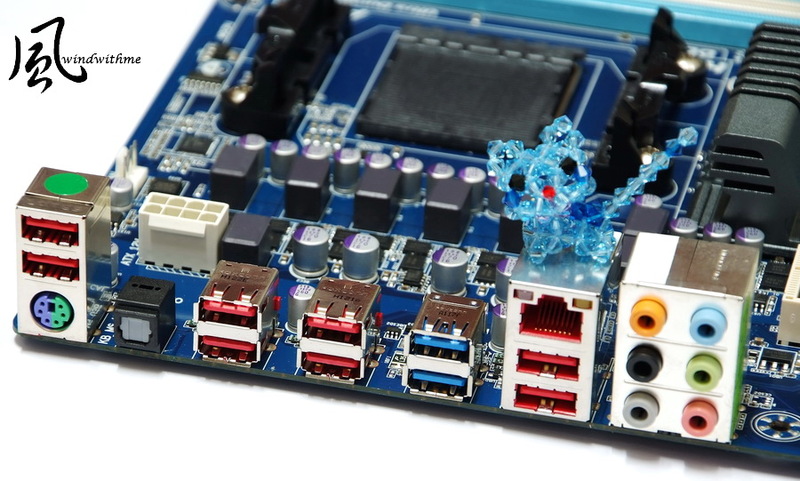 6 X Blue SATA provide by SB950 and support SATA3. It also supports RAID 0, RAID 1, RAID 5, RAID 10 and JBOD. TPM security encryption module slot and dual 32 Mbit Flash BIOS. 4 X DIMM DDR3 support 1066/1333/1600/1866/2000(OC). The max DDR3 capacity is 32GB. DDR3 2000 needs to pull CPU clock. Next is 24-PIN DC-In connector. 990FXA-D3 uses 4+1 phases PWM. The upper white connector is 8-PIN DC-In. 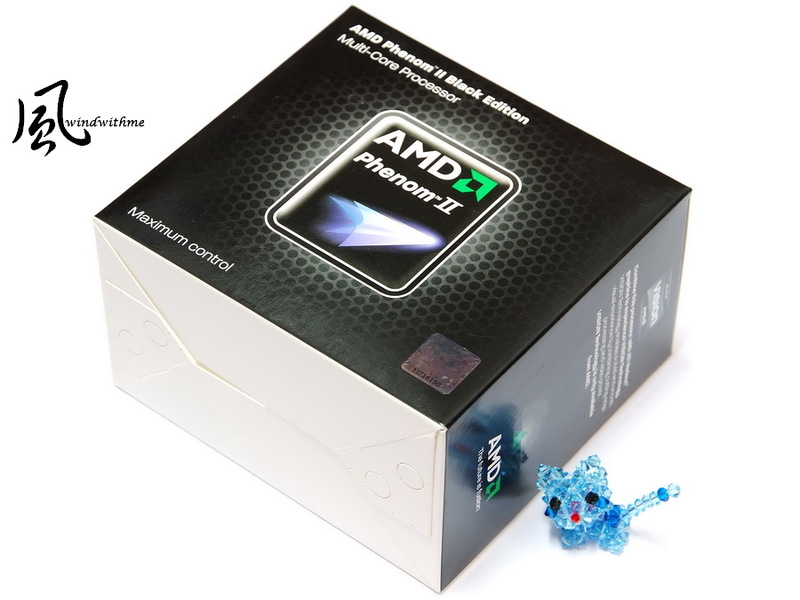 Black AM3+ socket supports AMD AM3+ FX/AM3 Phenom II/AMD Athlon II CPU. Besides CPUs are different, the other spec is all the same. As same software test below, the first pic is 1100T and second is FX-8120. CPUMARK and PI both have long history. I still remember K8 was always leading Pentium4 in CPUMARK and PI. 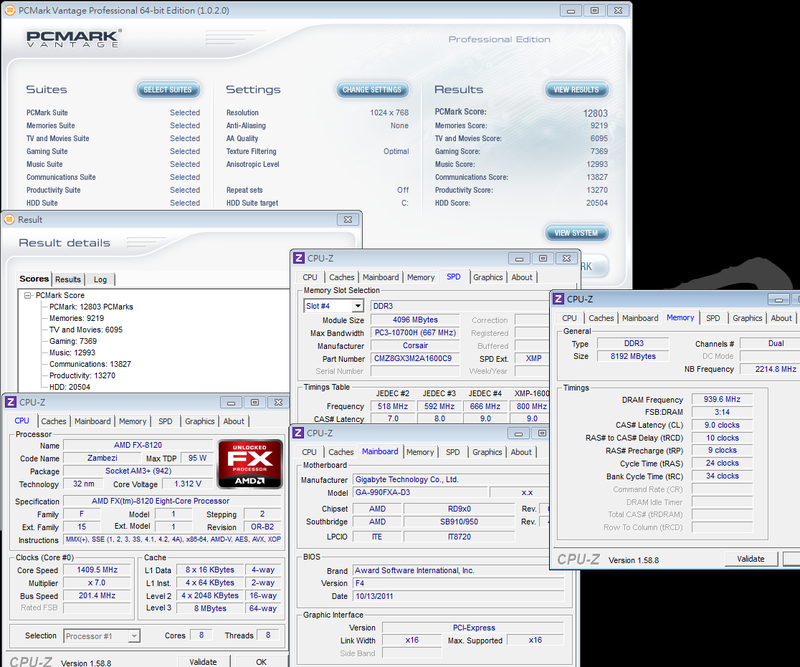 Till now, CPUMARK is still very good and easy benchmark software in single core test. Early stage, SUPER PI only can test single core CPU. Now, latest version Hyper PI can support 16 cores. It’s a very common benchmark software. 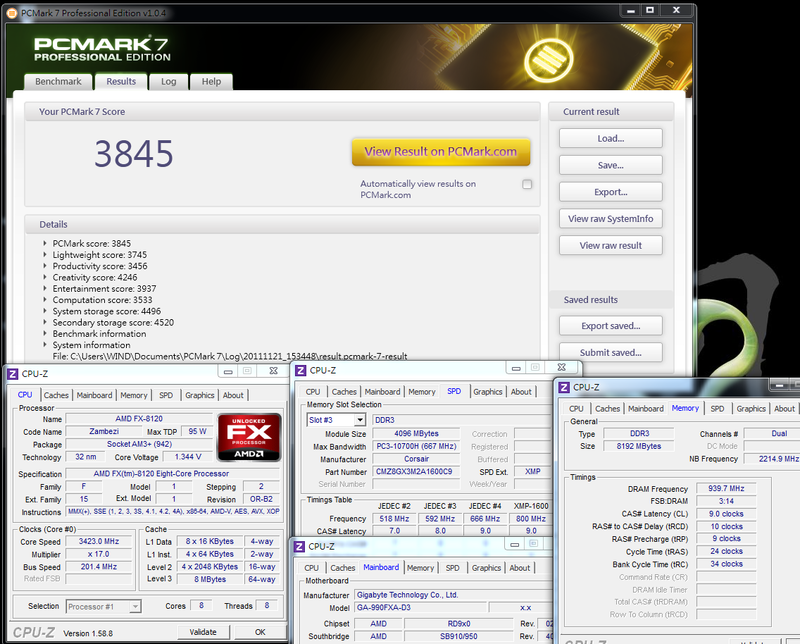 1100T single core performance is higher than FX-8210 around 19.1% in CPUMARK. In Hyper PI 32M, multi-core full speed is also 26.2% faster. Nuclearus Multi Core hasn’t been update after 2008. It doesn’t support multi-core well. As FX-8120, it can run Multi Thread Speed. In contrast, 1100T cannot run this option. Former 6-Cores 980X and recent 3-Cores A6-3500 also cannot finish the test. Implying it cannot support triple murderer cores?! However, we can refer to the full finished ALU Speed and FPU Speed items, 1100T is still leading obviously. Fritz Chess Benchmark is a multi-core benchmark by chess. It can support to 8 threads. 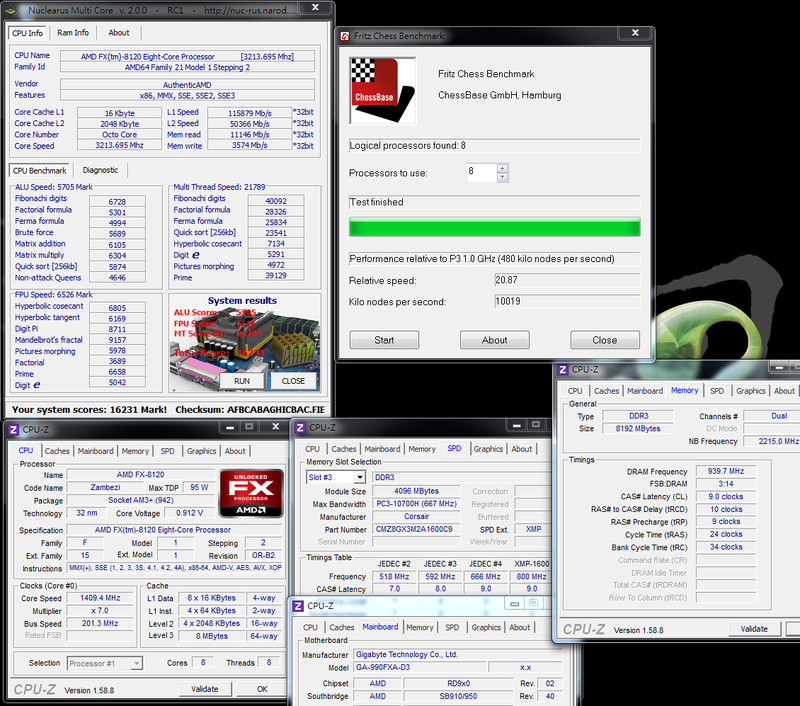 1100T 6-core full speed is 24.33 and FX-8120 8-core full speed is 20.87. 1100T is still 16.6% higher. CrystalMark 2004R3 test several items performance in full system. 1100T is still a little ahead in total score. If look into CPU performance, you can refer to the ALU and FPU to see the difference. 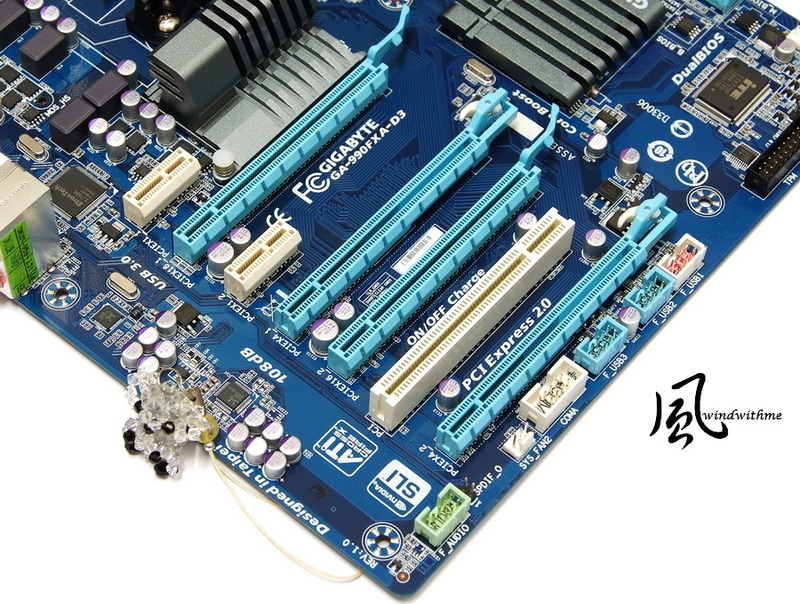 For DDR3 performance, FX-8120 has more advantages. You can see detail test below. 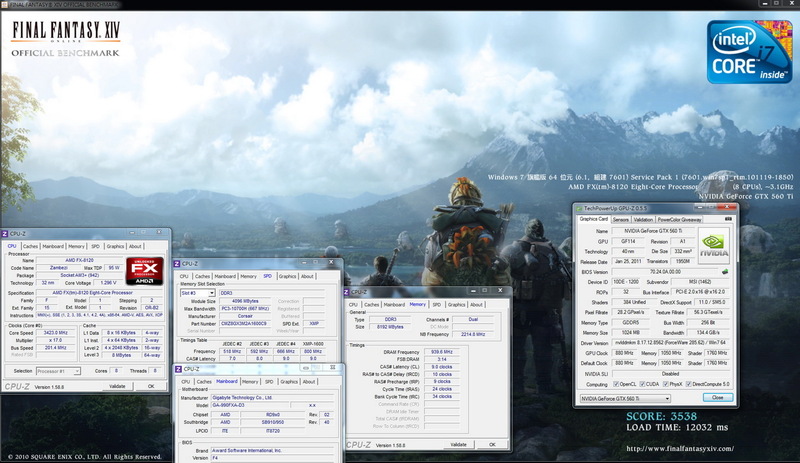 CINEBENCH is fastest updated and complete multi-core support. 1100T in single core performance is 13.5% higher. 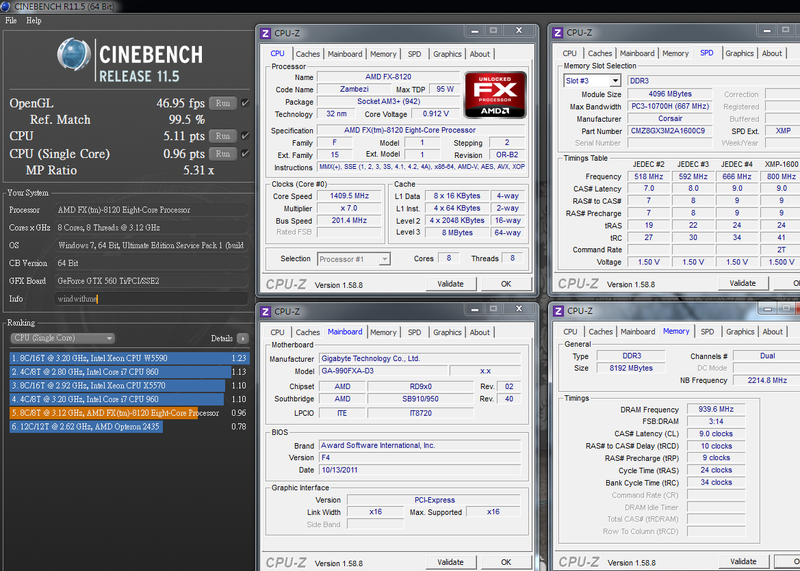 6-core full speed is also 14.9% higher than FX-8120 8-core full speed. MP Ratio can see 1100T 6-core efficiency is 5.36x, but FX-8120 8-core is only 5.31x. It looks like it’s caused by 4M8T new structure. OpenGL pages, FX-8120 is 9.3% higher. 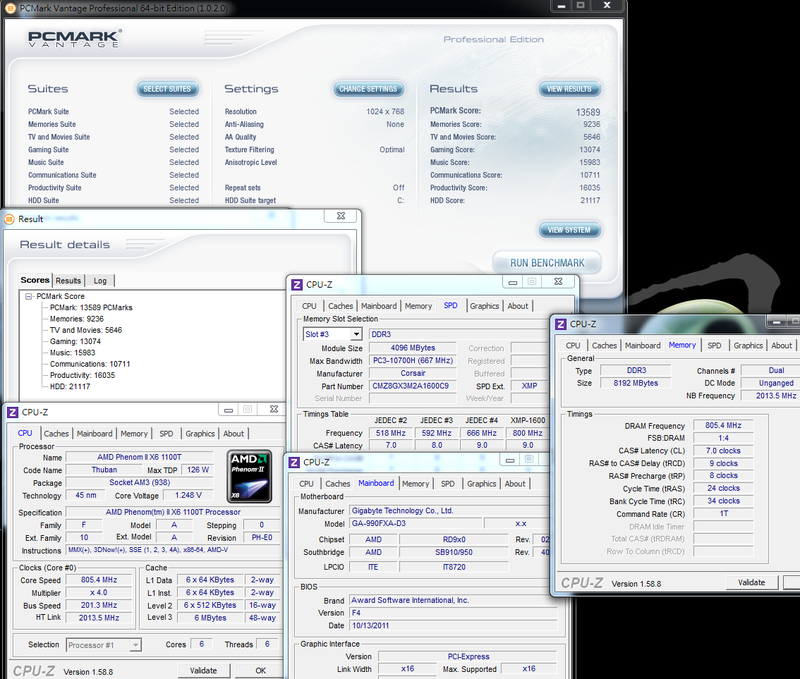 PCMark Vantage and PCMark7 are both system benchmark. The difference is not big. 1100T total score is a little bit higher. Basically, Windows Experience Index is very fast and convenient benchmark software. The accuracy is based on persons. 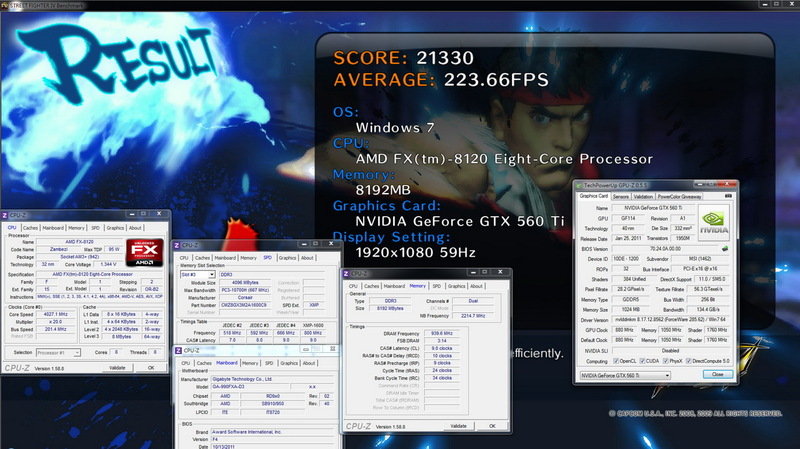 If using FX-8120 in other 990FX, the score is 7.8. However, the other benchmark is almost the same. In Z68, I also suffered this issue before. I set DRAM at DDR3-2133 and one Z68 got only 5.9 but the other got 7.9. 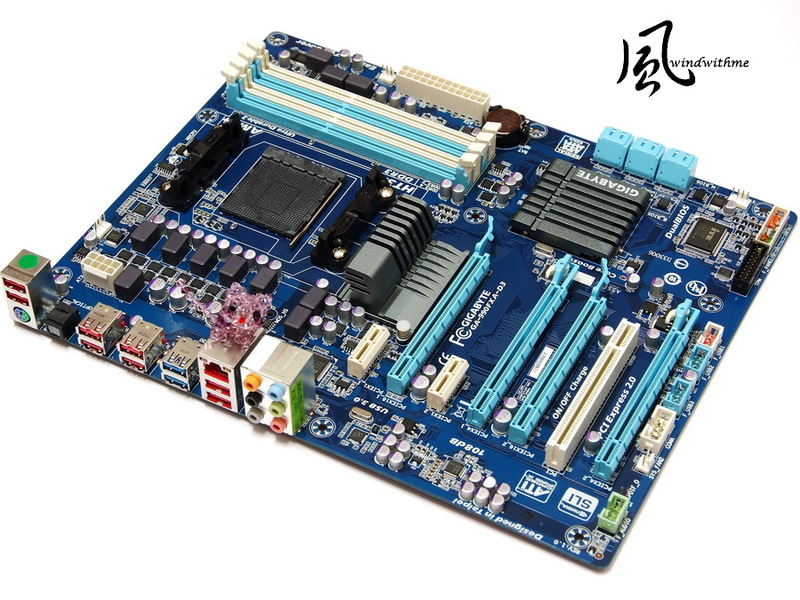 After comparing three DDR3 bandwidth software, the performance is same for both Z68 platforms. I only can say, Windows Experience Index is very simple benchmark tool. It’s just for reference. DRAM structure is the key change for FX-8120. It uses AMD latest Memory Controller. 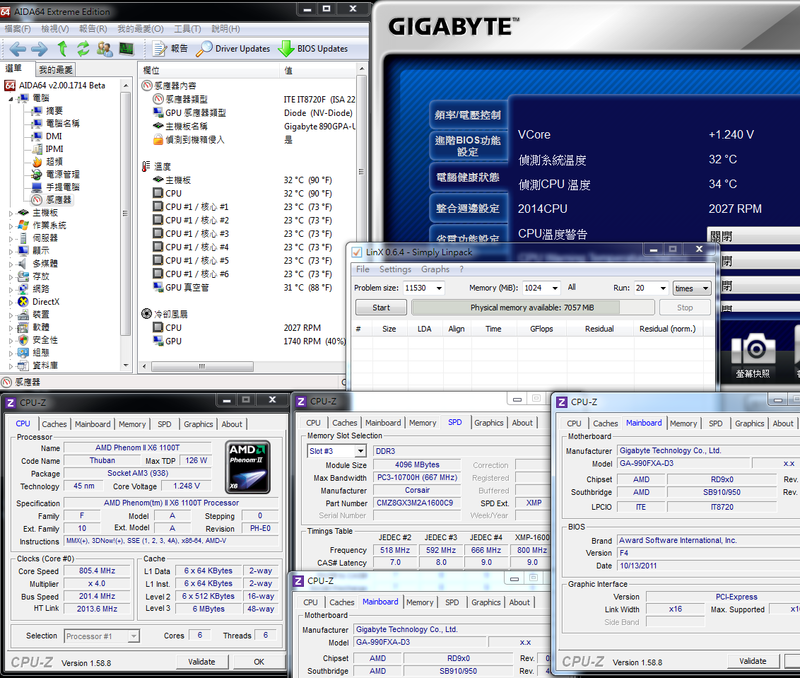 In CPU 200MHz and don’t OC frequency, the memory can set to DDR3 1866, but 1100T only can reach 1600. 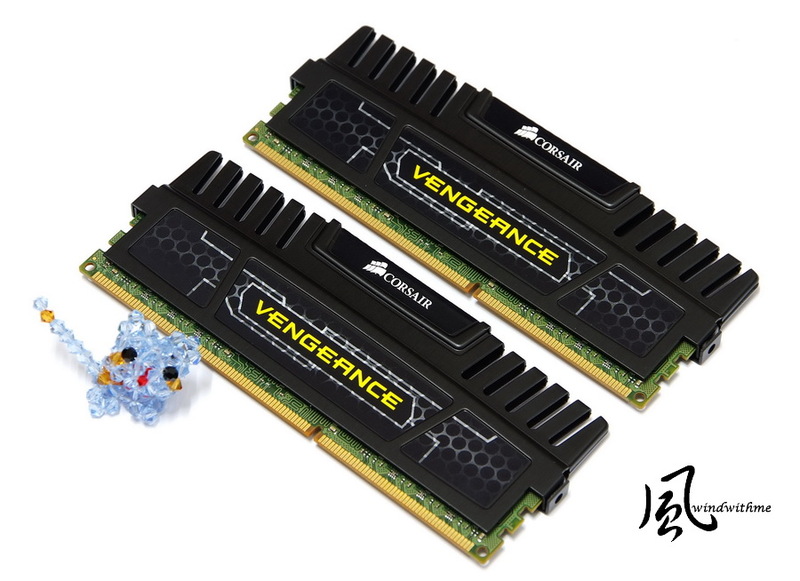 This review uses CORSAIR VENGEANCE series DDR3. The model is CMZ8GX3M2A1600C9. 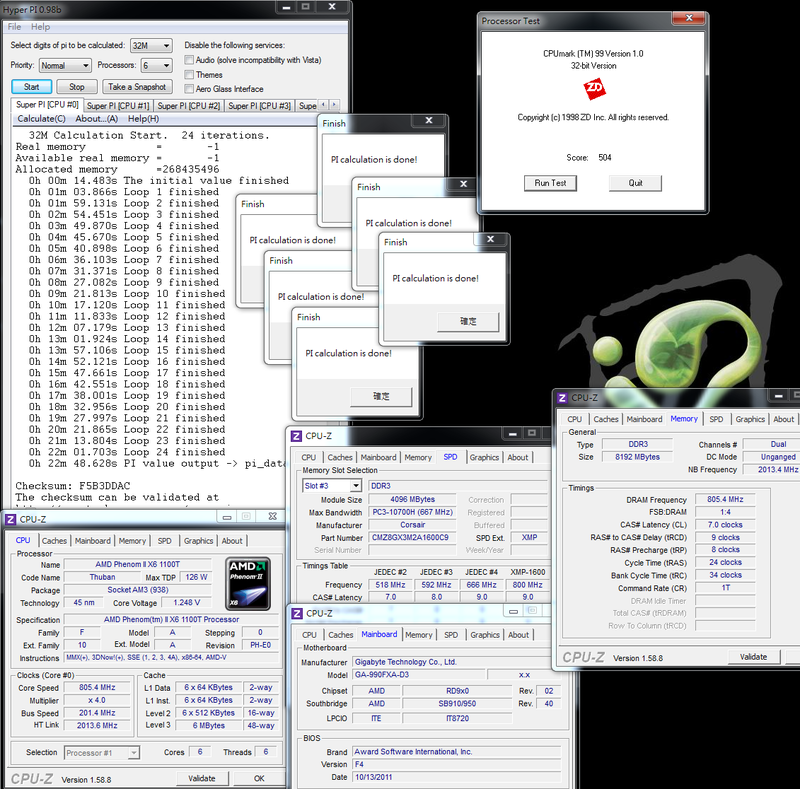 The packing shows it supports both AMD and Intel dual channel platforms. The capacity is 2 X 4GB. The clock is DDR3 1600. CAS Latency is 9 9-9-24 at 1.50V. 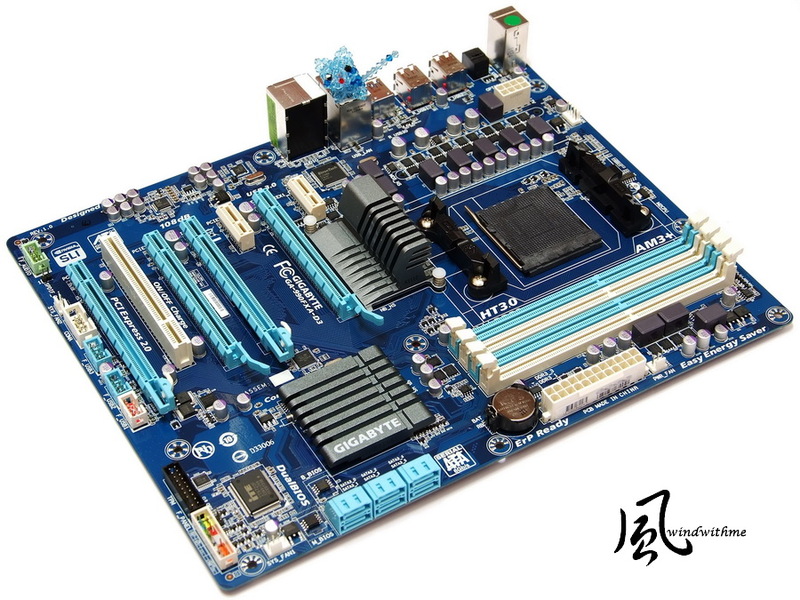 It meets AMD platform latest 1.5V voltage regulation. VENGEANCE series has black, red, blue and green colors. Each color means different spec and use. 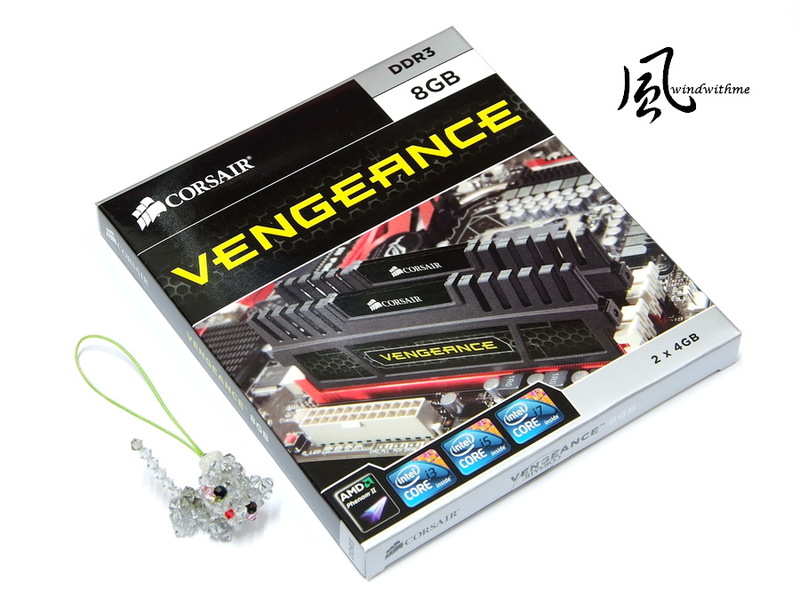 This VENGEANCE can work at DDR3 1600 CL7 or OC to 1866 CL9. 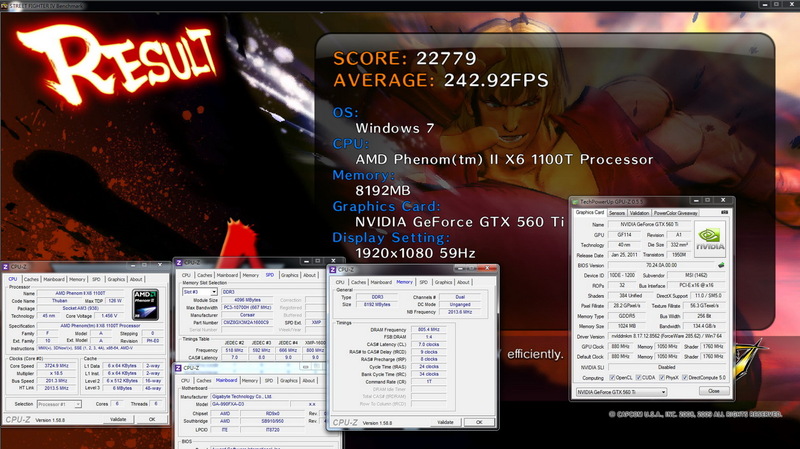 It’s good for enhancing these 2 CPUs performance. 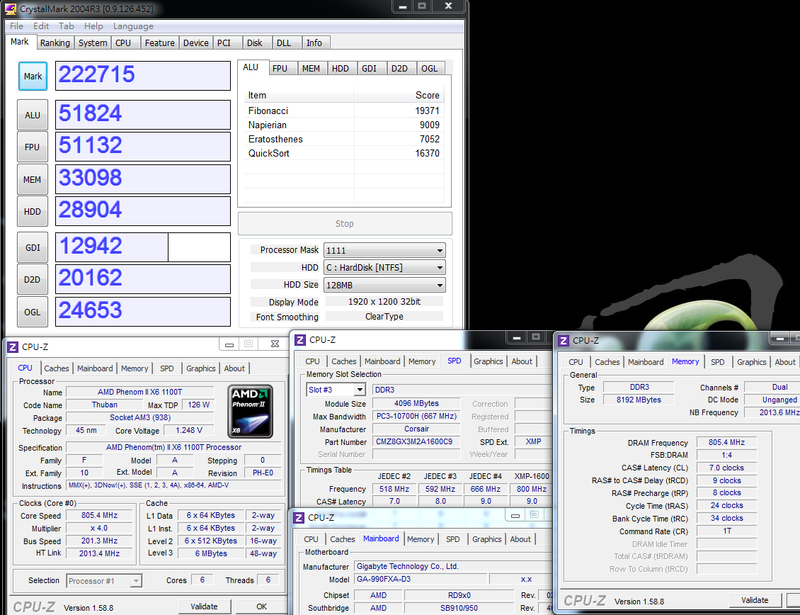 DDR3 bandwidth, FX-8120 wins 1100T in big gap. FX-8120 leads 58.4% in ADIA64, 41.9% in Sandra and 18.9% in MaXXMEM. FX-8120 bandwidth score is similar to Intel first Gen. Core i platform. It’s still a little behind 2nd Gen. Core i platform. At least it’s a shot in the AMD arm. In the past 8 years, this improvement is a big step. I hope they can catch up the competitor’s bandwidth. AMD32nm APU and FX series CPUs always show very temperature in most software. Sometimes, it’s even lower than room temperature. It’s often to see 8~16˚C. 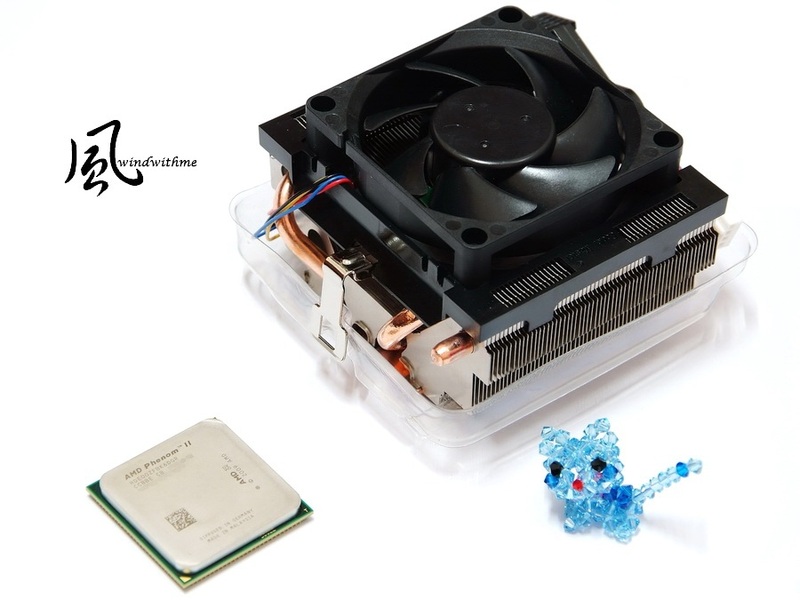 However, CPU is not a cooler. The temperature should be higher than room temperature. It shouldn’t be lower environment temperature. I will ignore AIDA number. For right side MB tool to compare, we can use this for reference. Even though, I think this number is still lower than FX-8120 real temperature. In Touch BIOS, 32nm FX-8120 burning temperature is much lower. It has 2 more cores than 1100T. As we set both in default mode, FX-8120 temperature owns the obvious advantage. When enter to OS desktop, FX-8120 power consumption is 7~10W lower. 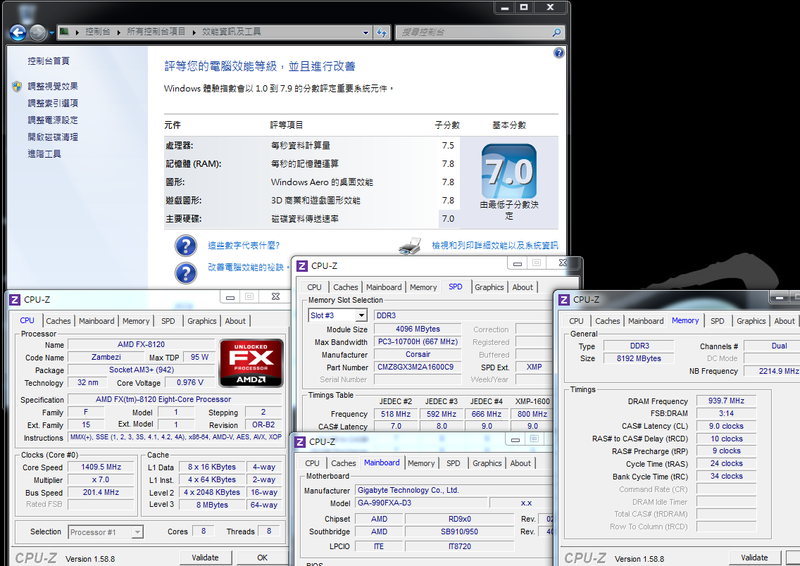 When both CPU work at multi-core full speed, FX-8120 power consumption is 72W lower. FX-8120 in default mode, no matter temperature or power consumption, it all shows 32nm advantage. In the premise, it’s only for default mode. I shared FX-8120 OC status in my previous review. 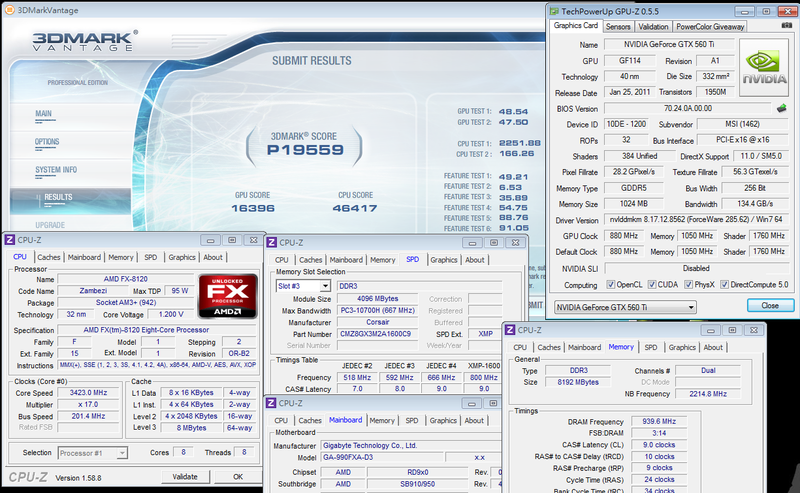 Even it’s 95W FX-8120, when I OC over 4.3GHz, the power consumption bump up to over 380W. FX-8120 temperature is also rise a lot. 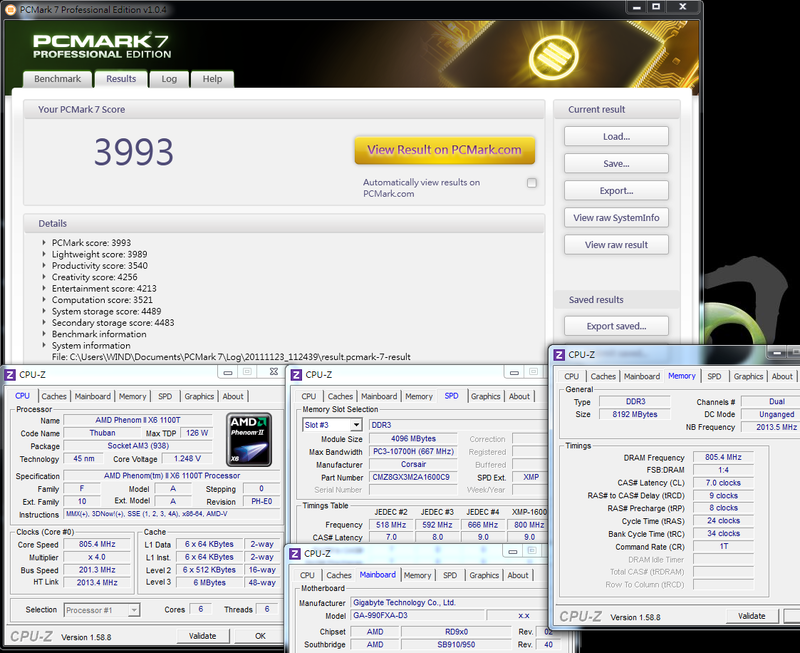 1100T in 3DMark Vantage, the 3D performance is 11.8% higher and CPU score is 17.1% more. In StreetFighter IV and FINAL FANTASY XIV, 1100Ts is also 8.6% and 13.6% higher than FX-8120. You can see for Game, CPU execution performance is very important. Also, most games just need 2~4Cores. For real 3D requirement, core number is not the most important factor. I suggest you to choose higher performance CPU. 1. The price segment is entry level in 3 major brands. 2. It has 4 PCI-E X16 and supports 2-Way ATI CFX and nVIDIA SLI technology. 3. IO provides 8 USB 2.0 and 2 USB 3.0 interface. Including front USB, user can have 14 USB 2.0 devices. 4. 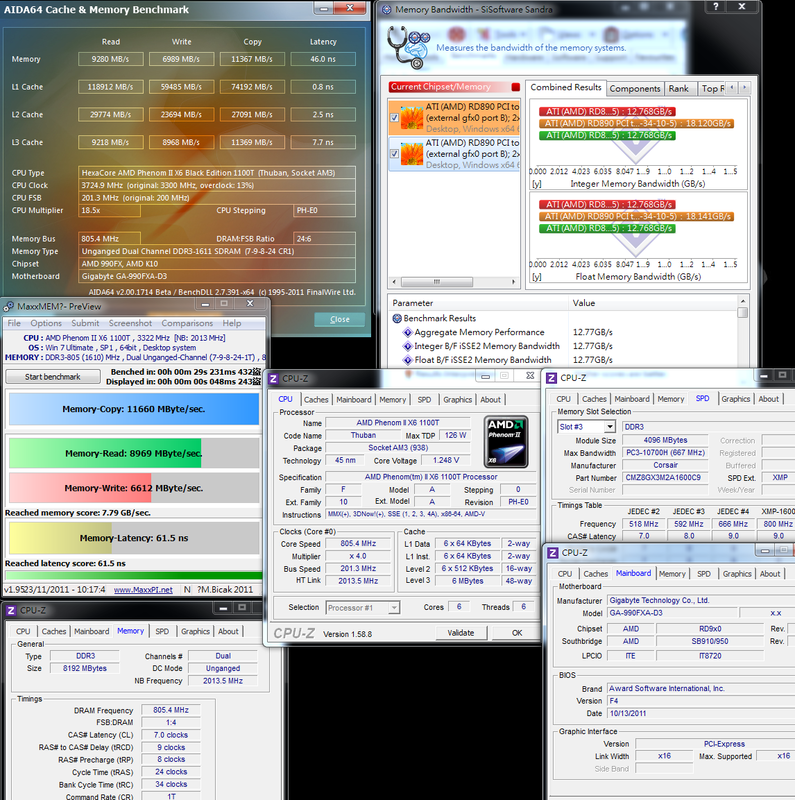 Built-in 6 native SATA3 support many RAID modes. 5. 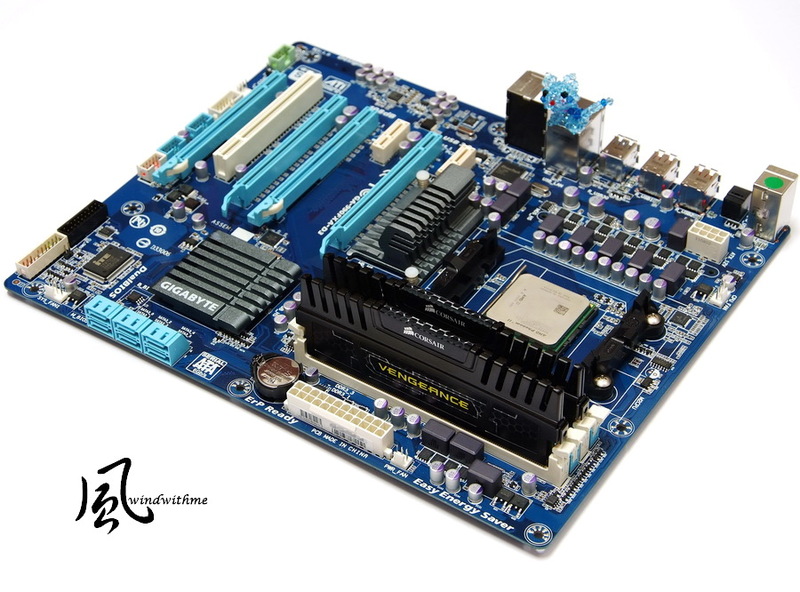 BIOS provides plenty items and wide voltage range which is good for OC or fine tune performance. 1. Heat sink is a little small and no pipe. 2. It’s no front USB 3.0 Port. 3. BIOS is not UEFI interface. After so many comparisons, you can see both CPU has their own strength and weakness. 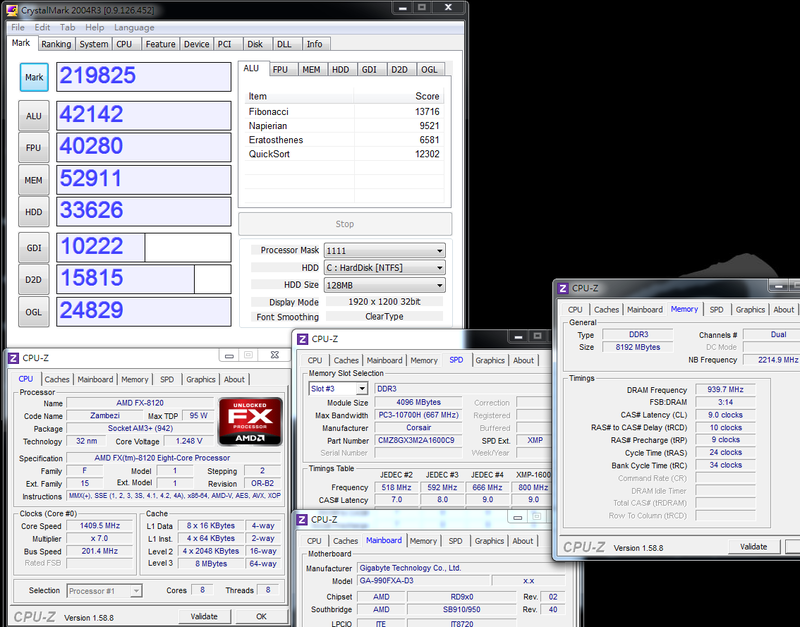 As default mode, no matter single core or multi-core performance, Phenom II X6 is all better than FX-8120. 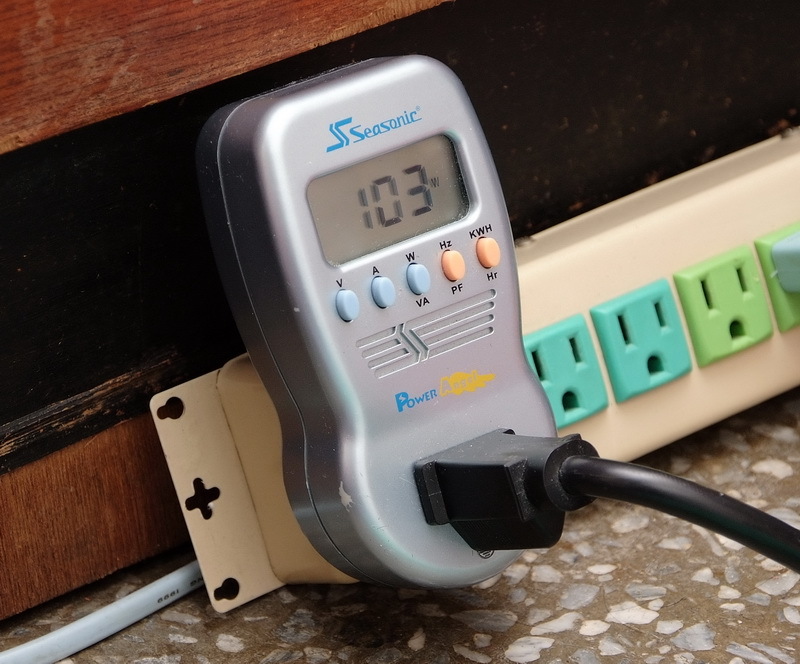 FX-8120 has obvious advantage in temperature and power consumption. Its’ CINEBENCH OpenGL page is also very good. 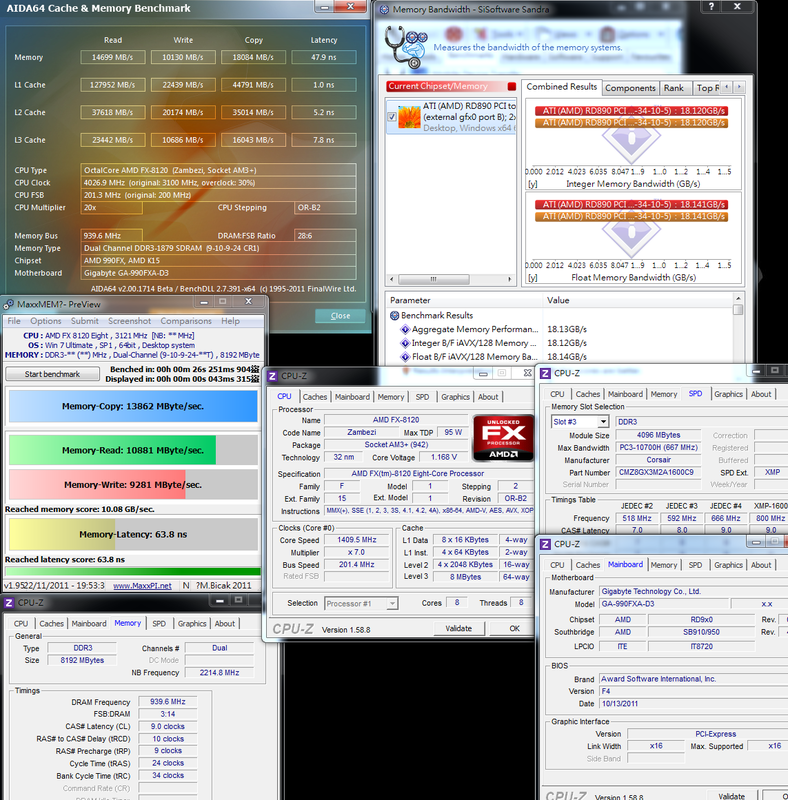 Also, FX CPU DDR3 bandwidth wins X6 a lot. This is Bulldozer structure main strength for performance. Maybe many readers think the benchmark is just numbers. They prefer to know the performance in real use environment. I use so many benchmark software, applications or games to test. I think the score is also consultative. 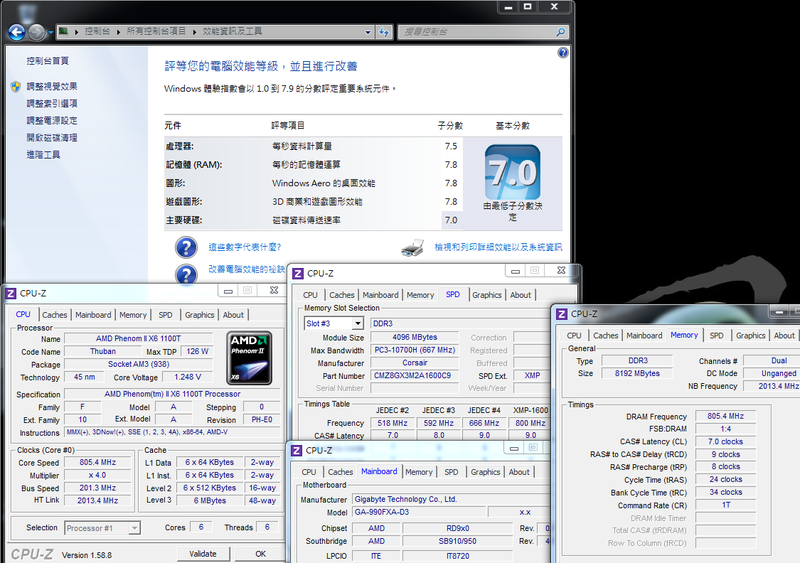 In the AMD market, if you are looking for better performance, you can choose Phenom II X6 CPU with 970X or entry 990FX. 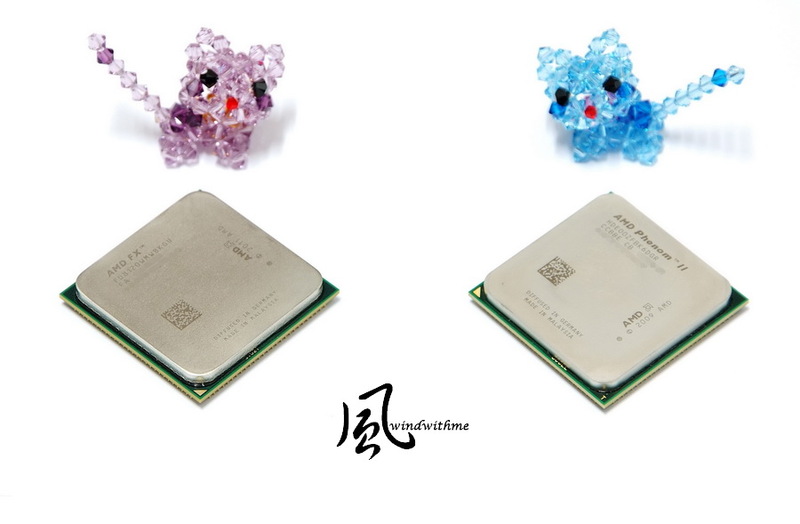 If you need more cores, better temperature, lower power consumption, latest AMD platform and don’t care the lower performance, you can choose FX-8120. However, the current price is a little bit high. 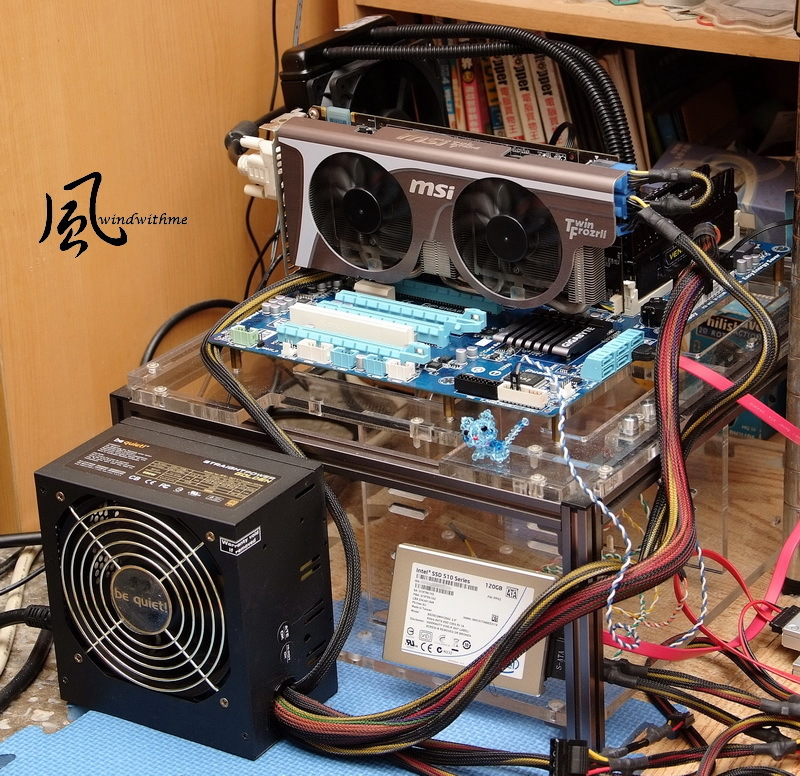 Bulldozer structure introduces 8-Cores to PC market, but the structure and performance is not good enough. 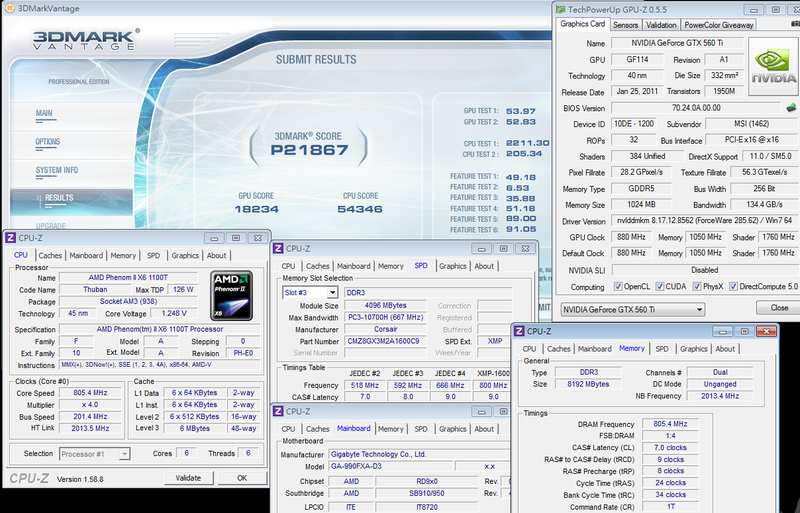 If AMD would like to break through the performance bottleneck currently, I suggest they can move Phenom II X6 to 32nm. Also improve Bulldozer structure to be more efficient and launch FX II to win back the users confidence. Above is windwithme sharing for AMD new platforms. As a smart users, for mainstream CPU, what your choice will be?